Bring dawn all ingredients(4) and reach 50000 points to complete the level. This is again hard level with ingredients requirement and the candy board with many grill boxes could make some problem. To complete this level you need to play with good strategy and if you already play lot of candy crush levels then it wont make that much problem. First you need to break grill boxes so then ingredients wont stuck on it and then try to break candies that the Odus owl have with balancing to increase moon power. As moon will get full power it will struck and break many same color candies and it will give many chances to make colorbomb or other special candy. You should try to combine special candies to each other or break candies that are below to ingredients to complete this level within moves. 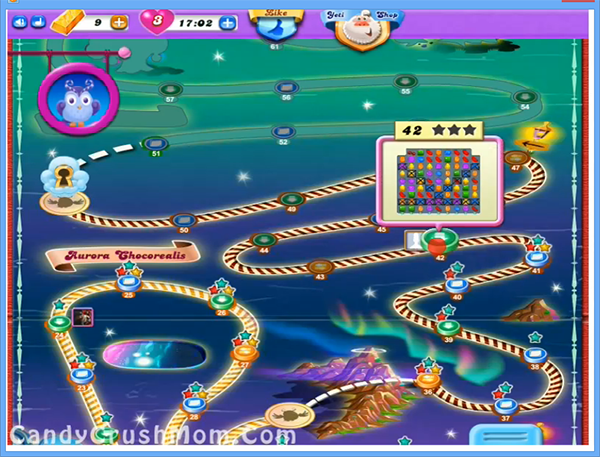 We completed this level with 121120 score by increasing moon power and playing more with special candies within 31 moves and remaining moves converted to striped candy that help to add more points on score board.